Tanning is available at Malibu Fitness for an additional fee. Package rates are offered for ten sessions, monthly unlimited, and yearly unlimited. 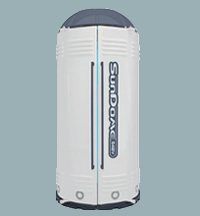 We offer the modern SunDome 548V Tanning Booth. Proven performance is what the SunDome® tanning booth is all about. Featuring 48 Wolff® system lamps in a unique stand-up design, you will love the tanning power and no contact 10 minute tanning session. Additionally, the ultimate in tanning products are available at the health club. Tanning appointments are recommended. Compare these prices to anyone in the state with similar equipment and you’ll discover that we can’t be beat.